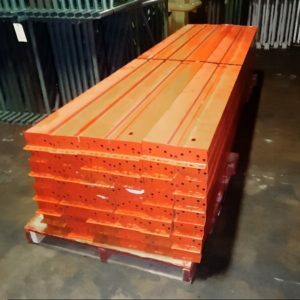 Our vast inventory of pallet rack beams includes many sizes and brands, including those hard to find brands. Beams: The beams in the selective pallet rack system can be either box beams, step beams or C-Channel type structural beams. Step Beams are designed with a step on the top which enables wire decking, pallet supports and other items to sit in the step to create a beam or shelf level within the racking bay. This step is typically 1 5/8” deep and is located at the top inside edge of the step beam. Located on each end of the step beams are connector clips which enable the beams to be attached to the uprights. These connectors have a variety of pins or hooks that connect to the upright itself. Box beams are made from the same roll formed steel but do not have the step on them. They are actually square shapes like a box. They too have the same type of connectors that the step beams do. Structural Beams are made from structural steel. The beam body itself is basically a C-Channel with a connector clip welded on both ends like the step and box beams. The connectors for the structural beams can by similar to the connectors for the roll formed beams. However, they are generally a bolt on type connector that enables the structural beam to be attached to the upright frame by running a bolt though the beam connector and the upright face and installing a nut on the bolt from the back side of the upright. Teardrop pallet racking systems are extremely popular among warehouse managers due to their ease of use and general effectiveness. The name ‘Teardrop’ refers to the teardrop shaped design of the holes, which are used to lock the horizontal beams onto the vertical standing uprights. The teardrop shape provides a lock-in connection that is safe and sturdy. Assembly is relatively quick and easy. Due to the teardrop design’s popularity, there are a lot of opportunities to mix and match various brands. Teardrop pallet rack beams have become one of many industry standards and are used by warehouses across the world. 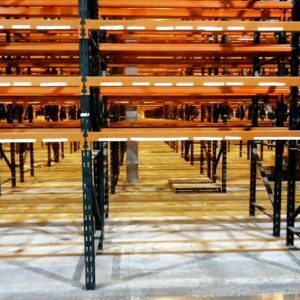 Pallet racks are a cost-effective way to maximize space and productivity in your warehouse. 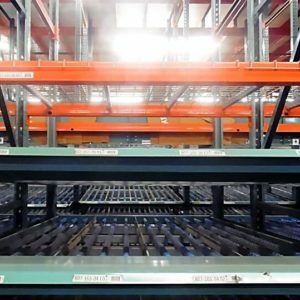 With Used-pallet rack.com, you can be sure that you are investing in a quality racking system, at the right price. Our inventory is large and boasts many popular racking brands and various sizes to fit your needs. We offer fast shipping across the nation. 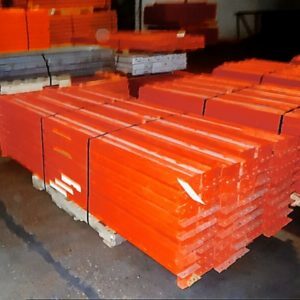 When it comes to tear drop pallet rack beams, we have exactly what you need to run an effective and safe warehouse. Our team is experienced and dedicated to getting you the used pallet racks you need for your warehouse at an affordable price. If you have questions, feel free to call or fill out a fast quote.